Sylvia Beach was a highly influential literary figure in Paris in the years between the two world wars. In 1919, she founded Shakespeare and Company, the innovative English language bookstore and lending library on the Left Bank, which quickly became the center of writers, aspiring writers, and book lovers of the "Lost Generation." Her second most famous act was to publish James Joyce's novel Ulysses when no commercial publisher would touch it. 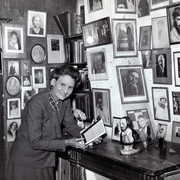 Shakespeare and Company was forced to close during the German Occupation of World War II but Miss Beach continued to live in Paris until her death. Sylvia Beach is currently considered a "single author." If one or more works are by a distinct, homonymous authors, go ahead and split the author. Sylvia Beach is composed of 2 names. You can examine and separate out names.